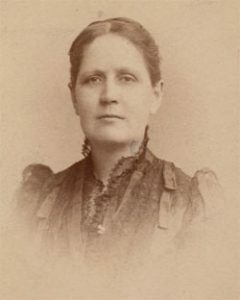 Drexel University College of Medicine Legacy Center: Portrait of Dr. Clara Marshall, Dean of Woman’s Medical College, 1888-1917. PHILADELPHIA, PA (March 23, 2016)—The National Endowment for the Humanities today announced that it has awarded the Historical Society of Pennsylvania a planning grant of $39,500 to identify material documenting the early struggle for women’s rights in the collections of members of the Philadelphia Area Consortium of Special Collections Libraries (PACSCL) and to share a sampling of them online. “We are honored to be among the 248 organizations whose humanities projects have been supported by this year’s awards program,” said PACSCL chair Ronald Brashear, in announcing the grant. The project will build on the work of 11 PACSCL libraries, led by the Historical Society of Pennsylvania, Temple University, and the Drexel University College of Medicine (DUCOM) Legacy Center. The project will begin with a survey of collections on the themes of women’s rights – the woman’s suffrage movement, work-related rights and professional opportunities, education, civic activism, and related issues. It will continue with the digitization of representative materials and construction of an online presentation that will draw from materials hosted at participating web sites. It will serve as both a resource for students, teachers, and resources and as a proof of concept for an expanded set of online tools. Adds Page Talbott, president of The Historical Society of Pennsylvania, “We are delighted to be able to play a leadership role in this exciting project by contributing collections and serving as the grant administrator. It helps us to fulfill our mission by building our digital collections and will strengthen our work with middle- and high-school students for projects such as National History Day.“ She also noted that the collections illustrate some of the complexities that surround the concept of women’s rights: expanding rights for white and economically privileged women has sometimes gone hand in hand with denying or limiting rights for women of color or poor and working class women. “Working collaboratively provides an opportunity to tell the stories reflected in materials held at multiple repositories,” says Margaret Graham, managing archivist at DUCOM and co-principal investigator. Portals such as DUCOM’s “Doctor or Doctress?” site (http://doctordoctress.org/) or Temple’s “Civil Rights in a Northern City: Philadelphia” (http://northerncity.library.temple.edu/) show work at individual partners that use materials from their collections and have been consulted by high school students for National History Day and other projects, by undergraduates as alternative textbook content, and by the general public interested in lifelong learning about significant events in history. The new College Women site (http://www.collegewomen.org/), a project of partner library Bryn Mawr College and six other institutions, offers one example of the kinds of collaborative portals that can be constructed. In addition to the three principal partners, current participants include: The Athenaeum of Philadelphia; Bryn Mawr College; Haverford College; the Library Company of Philadelphia; the National Archives at Philadelphia; Friends Historical Library and the Swarthmore College Peace Collection; and the University of Pennsylvania School of Nursing’s Barbara Bates Center for the Study of the History of Nursing. Celebrating its 50th anniversary as an independent federal agency in 2015-16, the National Endowment for the Humanities brings the best in humanities research, public programs, education, and preservation projects to the American people. To date, NEH has awarded $5 billion in grants to build the nation’s cultural capital – at museums, libraries, colleges and universities, archives, and historical societies – and advance our understanding and appreciation of history, literature, philosophy, and language. The Historical Society of Pennsylvania is a provider of education and information for the people of Philadelphia and beyond. With over 21 million documents – including manuscripts, graphics, and ephemera – HSP serves more than 4,000 researchers who come through its doors annually and millions more around the globe who use its resources online at hsp.org. HSP offers extensive online resources including digital collections, curricular materials, and hosts educator workshops, public programs and lectures throughout the year. The Special Collections Research Center, Temple University Libraries is the principal repository for and steward of the Libraries’ rare books, manuscripts, archives and University records. The Center collects, preserves, and makes accessible primary resources and rare or unique materials, to stimulate, enrich, and support research, teaching, learning, and administration at Temple University. SCRC makes these resources available to a broad constituency as part of the University’s engagement with the larger community of scholars and independent researchers. The Drexel University College of Medicine Legacy Center is the repository for the records and heritage of Drexel University College of Medicine and its predecessor institutions, including Woman’s Medical College of Pennsylvania and Hahnemann University. “Woman’s Med” was the first medical school in the world for women and the longest lasting. The Legacy Center supports research and investigation of the history of women in medicine and the early history of homeopathic medicine in the United States. The 40 member libraries and archives of the Philadelphia Area Consortium of Special Collections Libraries (PACSCL) collect, care for, and share with a world-wide audience collections that, in their depth and variety, comprise an internationally important body of unique materials for students, scholars and lifelong learners at any level. The collections of PACSCL member libraries include a total of more than 4,000,000 rare books, 260,000 linear feet of manuscripts and archival materials, and 9,000,000 photographs, maps, architectural drawings, and works of art on paper. 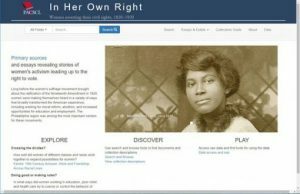 The “In Her Own Right” project has been made possible in part by a major grant from the National Endowment for the Humanities: Celebrating 50 Years of Excellence. Any views, findings, conclusions, or recommendations expressed in this announcement do not necessarily represent those of the National Endowment for the Humanities.